Many of us are familiar with the term “cause-related marketing.” Sometimes the phrase is applied in a broad sense to any effort to increase public awareness of an important issue. A narrower definition is a campaign by a corporation to support a cause, either (cynically) to promote its own brand or (unselfishly) to lend its support to a worthy pursuit—depending on your point of view. The Internet, the airwaves, and print media are rife with cause-related marketing. How many times, for instance, have you encountered ads by oil companies and automobile manufacturers touting their “green” practices? Cause-related mapping, on the other hand, is a far less common phenomenon. What is cause-related mapping? It’s my own term, so I’m happy to propose a definition: It’s the use of maps, in combination with other rich media, to inform and engage the public in support of important causes. Every issue you can think of, from climate change to poverty reduction to job creation, has interesting and important geographic characteristics. 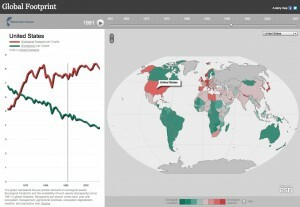 Maps reveal spatial patterns, facilitate understanding, and help us make sense of the world. And yet how many times can you recall an organization using maps to show you why an issue is important and what you can do about it? Hardly ever, right? Now that maps are enabled via the Internet and distributed to our laptops, tablets, and smartphones, the potential for using them to catalyze awareness and action has become all the greater. Maps used to tell us stories in a singularly understated way. Now, supercharged by digital technology, distributed instantaneously across electronic networks, and enlivened by innovative user experiences, they’ve become much more active and versatile storytellers. 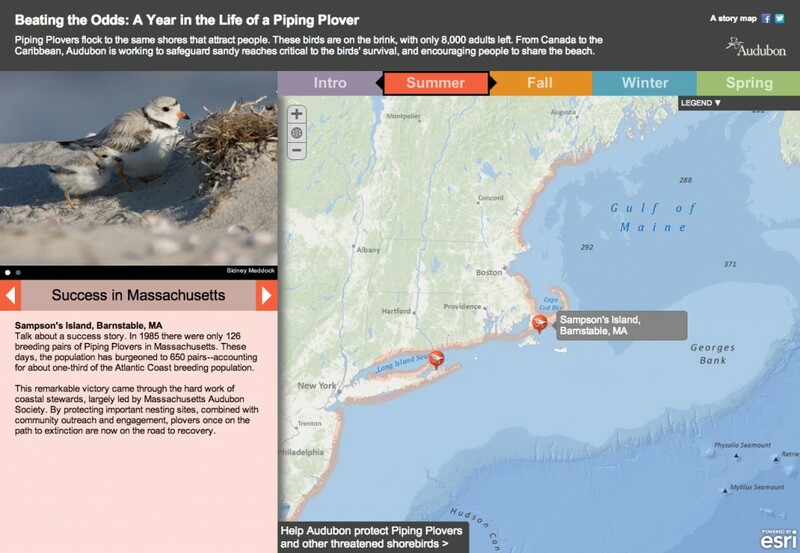 Recently we teamed up with the National Audubon Society to depict the life cycle of the Piping Plover, a shorebird that nests, precariously, adjacent to Atlantic Coast beaches and is thus in constant conflict with Homo sapiens recreationi. The story reveals the many threats facing these beautiful little birds as they breed, migrate, and winter, and it shows how Audubon is working to protect it at every step of the way. A few months ago we collaborated with IUCN, the big international conservation organization, to raise awareness of the increasing threat that human activities are bringing to the diverse array of life on earth. The conservation community depends on IUCN’s “Red List” as the definitive catalog of thousands of rare and endangered species worldwide. 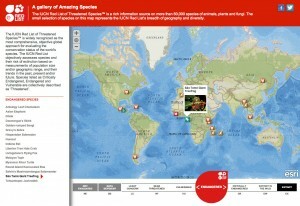 Our story map profiles a selection of these species via a world map. A click on a map icon generates a species profile, including a close-up range map, photo, text description, and link to technical information. These examples only hint at the potential of cause-related mapping. Thousands of humanitarian and conservation organizations administer countless projects in nearly every corner of the earth. Yet few people are aware of the vast scope of these operations. Wouldn’t donors be inspired to see the distribution and breadth of these efforts? Wouldn’t you, as a potential donor or volunteer, want to know more about the local, on-the-ground work of the groups that you support? Wouldn’t more people be inspired to support conservation if they could track, in near-real time, the movements of animals across threatened landscapes? Maps can help turn abstract issues into tangible, understandable, solvable stories. Maps can inspire action. Let’s use them not only to measure and observe the world, but to change it.